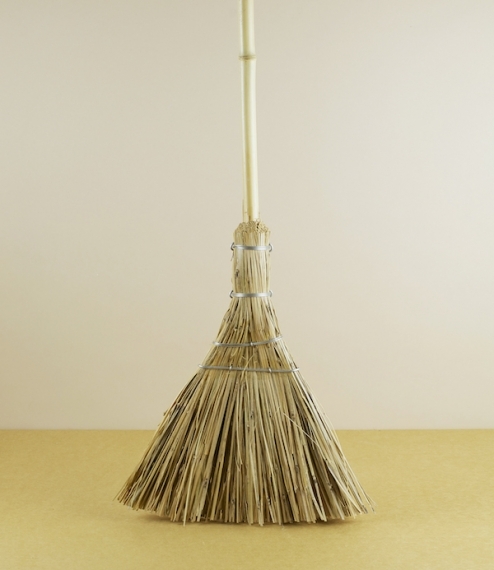 A Chinese made broom of whole and split bamboo, hand formed and tightly wire bound. A lightweight but stiff brush ideal for the quick and regular sweeping of yards or smaller outdoor areas. There is a perception that ‘made in China’ might be taken as an index of poor quality, worker exploitation, and unsustainable environmental disregard, and in some instances this does seem to be true; but thankfully not all. In fact aren’t we equally to blame for the flooding of our markets with poor quality and underpriced goods, don’t we receive largely what we demand, and in many instances collude in the obfuscation of their origin, with an economy of truth disguising the place of their manufacture with long tales and nostalgic depictions of their heritage. (I know of one popular brand of enamelware which claims to have been produced in the same factory for over 60 years - it may have the same name, but it has also had three different locations (currently Guangdong, China) which for me stretches the notion beyond credibility.) Irrespective of our preconceptions not all the tools and house-wares produced in China are of ineluctably poor quality some, especially those produced for the home market, are, whilst frequently crude and roughly finished, possessed of a remarkable ingenuity and economy of manufacture and design that results in simple tools more than adequate for their intended purpose. The genius of outsider design. Total length about 140cm and width across the head 25cm.